Over the last decade, the concept of coworking or furnished office spaces has grown considerably in all the large metropolitan cities. Coworking facilities offer renters fiber connectivity via Ethernet, dedicated mailing addresses, after-hours access, conference rooms, and space for company events, quiet areas, and sometimes on-site storage. The amount of business office tools and amenities will of course vary by the rental plan chosen, and the facility one rents from. Why Choose A Coworking or Furnished Office Space? By making unconventional office space arrangements, “cosharing” offers the small business operator, the freelancer, or telecommuter, the advantages of flexibility, cost control, and short term leasing obligations in order to provide working spaces with the same basic amenities needed in order to run a conventional business or project. And all this can be achieved without having to deal with all the overhead costs. For the same reasons stated above, coworking is beneficial to start-up entrepreneurs, who do not have a large staff yet, or the funds nor shelf-life stability to justify the long term commitment, and mounting expenses of renting, furnishing, and staffing a conventional office space rental. What does it cost to rent a co-working space? In this case, we will use two examples of coworking or furnished office space rental fees from large business oriented cities from both coasts, such as Seattle and New York. Seattle: The average traditional office rental in Seattle will cost about $20 to $30 per sq. ft., or around $350 a month to use a basic coworking space. New York City: Where traditional office space leasing costs start around $60 to $80 a sq. ft., a furnished office space with a basic desk set up in New York City, will cost approximately $500 per month (depending on location and amenities). Like any service, coworking or furnished office spaces have some many advantages, but also some disadvantages. Below is a quick synopsis of each: Pros: • No more home office loneliness, or home calamities – One of telecommuters main laments, is the absence of human interaction at the too quiet, and sometimes very lonely home office. Or on the other spectrum, kids, wives, relatives, and other loved ones, that just do not seem to realize that the home office is a place of work. • Networking with other professionals – It is hard to gain new prospects for your business, not to mention sometimes free professional advice when working all alone in a private home office. • A professional but low maintenance setting – One of the great benefits of renting a coworking space, especially for freelancers and telecommuters, is being able to meet clients in a professional setting, or talk to important business contacts over the phone in a controllable environment. Something that is not guaranteed in a home, or coffee shop setting. Cons: • Office amenities or the lack thereof – Coworking or furnished spaces are all different. Some may have receptionists, printers, scanners, etc. Some may require you to work solely from your laptop, depending on your rental plan, or the facility's capabilities. Office supplies are not free either, so you may have to bring your own in or pay extra for everything you end up using. • Cost – Coworking may be flexible for many business needs, but the bottom line for telecommuters is that it is still more expensive than working in a home office. All in all, the question of whether to rent a coworking or furnished office space verses leasing traditional office space, truly comes down to what is good for you, your work, and your business. In the end, your needs, your budget, and peace of mind, will ultimately be the deciding factors in whether to coshare your working space or not. 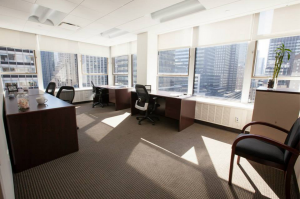 If you are in the market for a furnished office space, conference room or a virtual address in Manhattan, Corporate Suites offers several options. All our furnished suites are in prestigious and desirable locations. Please click here to view all our locations.